The board is the standard 96Boards credit-card form factor powered by an 8-18V DC 2A power supply. 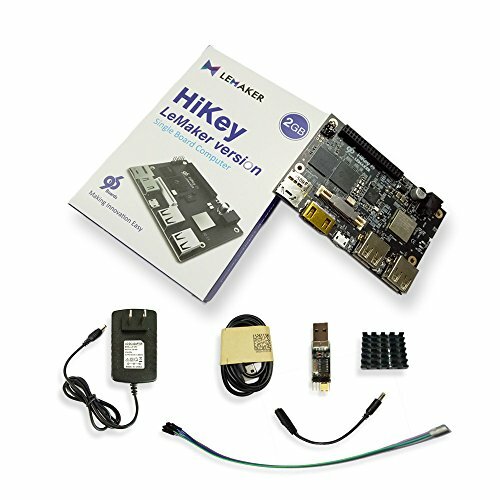 Android6.0 Linux DEMO BOARD credit-card COMPUTER: LeMaker HiKey is the culmination of collaboration by Google, Huawei, and Linaro to create the de-facto reference development platform for Android. OPEN SOURCE HARDWARE PLATFORM BASED ON 96BOARDS CONSUMER EDITION AND ANDROID OPEN SOURCE PROJECT: Open access to kernel source and board schematics enable developers to easily create and debug new and existing peripheral drivers, do kernel development, and perform other tasks with fewer OEM encumbrances. Designing ARM-based products has never been easier and more open! FEATUREFUL PERFORMANT SOC: Huawei HiSilicon Kirin 620 SoC is an Octa-Core ARM® CortexTM-A53 CPU operating up to 1.2GHz. Utilizing the latest 64 bit ARMv8 instruction set and integrated with the ARM Mali450-MP4 GPU, the HiKey supports 2D/3D graphics processing via OpenGL ES 1.1/2.0 and OpenVG 1.1.